Do Virgin Atlantic really believe in "maintaining social connections" in their Business Class cabin, or did BA catch them on the back foot? If you’d asked us last week what Virgin Atlantic would do in its new Upper Class cabin on the upcoming A350-1000, our answer was easy. Three weeks after arch-rival British Airways announced it would finally replace its decades-old Club World offering with direct aisle access ‘Club Suites’ including closing privacy doors, there was no other way for Virgin to go. In our opinion, the trendsetting airline would at the very least go with the Thompson Vantage XL Suite, already used by 49% owner Delta as the ‘Delta One Suite’. Jazz it up with a bit more purple leather and pink lighting, throw a bar in at the back, and there you have it. Virgin has opted for the latest version of the Safran (formerly Zodiac Aerospace) Cirrus seat for its latest Upper Class. First marketed to airlines about 18 months ago, they are the only airline so far to opt for the ‘Cirrus NG’ product. Bells and whistles? Yes. Enhancements aplenty? Sure. Revolutionary? No. In its fundamental form, the Cirrus seat was first launched by US Airways as its Business Class product ten years ago, in 2009, more notably being chosen by Cathay Pacific for its Business Class two years later in 2011. Today you can find the same basic design, without the ‘NG’ enhancements, in the Business Class cabin of at least eight different airlines, including Finnair, JAL and Vietnam Airlines. The Cirrus seat features a ‘reverse herringbone’ configuration, which Virgin Atlantic has adopted in the Upper Class cabin. There’s a subtle difference though, while window seats face the window, away from the aisle (unlike Virgin’s current design), the middle seats will face away from one another, towards the aisle in each case. Effectively it means every new Upper Class seat will face towards the window, in stark contrast to the current arrangement for ‘window’ seat passengers flying Business Class on Virgin Atlantic, who sit almost with their back to it. The seat converts into a fully flat bed, however unlike the current product there is now no need to get out of your seat and flip the back over to convert it, as this will be achieved at the touch of a button. The seat slides forwards into the flat-bed position like most Business Class products on the market. Like BA’s upcoming Club Suite, the seat has a three point seatbelt with an additional shoulder strap, though this will only need to be worn during takeoff and landing. It is not required for turbulence or, thankfully, for sleeping. Another addition to existing Cirrus seats is the extendable privacy partition at each seat. This is most generously described as a ‘half door’, and most realistically described as a ‘privacy divider’. It extends by only a few inches and does not enclose this seat into a full ‘suite’. That’s surprising as it certainly bucks the industry trend lately, with Qatar’s Qsuite and Delta’s One Suite, not to mention the upcoming British Airways Club Suite. Virgin’s rationale behind not adding a door to enclose their new Upper Class seats surrounds maintaining “social connections” between passengers, and promoting ease of service for the crew. We would have thought if you wished to be sociable, you could just leave the door open. One of the focal points of Virgin Atlantic’s fleet of aircraft for years has been the Upper Class bar. Long before Emirates ever had the ‘idea’, Virgin Atlantic crews were mixing cocktails and sharing anecdotes with top-tier passengers in the closest resemblance they could muster to the upper deck lounges of early Boeing 747s in the 1970s. this has been a mainstay on Virgin Atlantic aircraft for years. It’s no more with the A350-1000. The new version, which isn’t a bar, is called ‘The Loft’. The focal point of Virgin Atlantic’s A350-1000, ‘The Loft’ is the eight-seat lounge / social area. This is located at the second main aircraft doors, where most passengers are designed to embark and disembark (an additional airbridge connecting the forward passenger door for Upper Class passengers will sometimes be used). Virgin has designed this as a space for Upper Class passengers to “gather, dine, watch a short film, or have a meeting”. It certainly looks well designed and makes good use of space at the second main aircraft doors, much of which often goes to waste anyway. It’s nice that it includes a solo seat for individual travellers who may want a change of scene from their seat, plus a sofa for couples and another for larger groups. There is also a small counter top where two people can stand and chat, though that looks awfully close in the layout shown above to the poor passenger in seat 11A, who may hear every word you say. Virgin will no doubt be hoping the impressive sight of ‘The Loft’ as you board your flight in Economy or Premium Economy Class (or, let’s face it, disembark the flight after several hours of interrupted sleep), may entice you to ‘upgrade’ on your next trip. 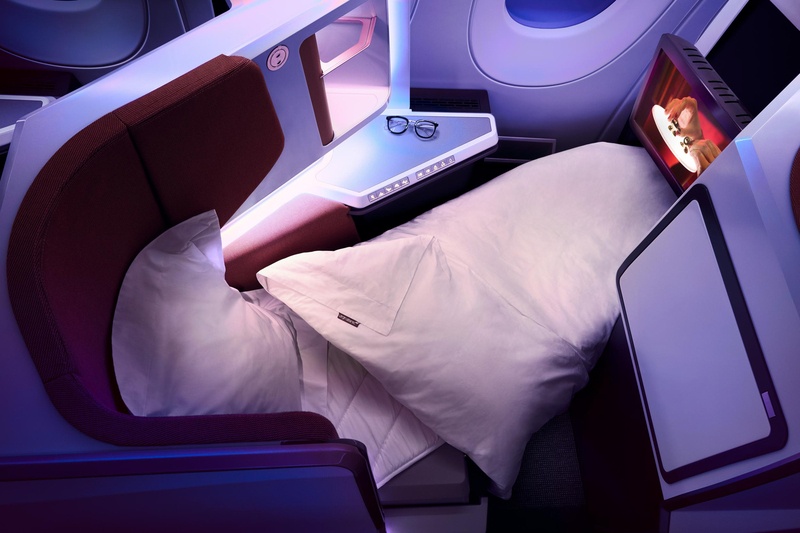 The seat will convert into an 82″ long bed, a good two inches longer than the current Upper Class product and three inches longer than the bed length promised in the upcoming British Airways ‘Club Suites’. Seat width suffers though, at just 20″ that’s two inches less than both the current seat and the new BA offering. It’s also a full four inches less than the 24″ seat width in the Delta One Suite. Larger passengers will feel the squeeze here. In-flight entertainment screens with match those offered in the new British Airways product with 18.5″ of high-definition to enjoy. Unfortunately though the extending nature of the screen in this design currently does not allow gate-to-gate programming. A tail camera will link to the IFE screen, though this seems a bit pointless unless Virgin can overcome the regulatory issue of not being able to clearly see your screen during the takeoff and landing phases. All 12 of Virgin’s order for these new aircraft should be delivered by the end of 2021, replacing Boeing 747-400s and Airbus A340-600s in the existing fleet. Four aircraft are either having cabin fit work or are already on the final assembly line in Toulouse, with a small gap in deliveries after that before they recommence from 2020. These first aircraft will arrive with 44 seats in Upper Class in a 1-2-1 layout, 56 in Premium Economy in a 2-4-2 configuration and 235 in Economy Class laid out in a 3-3-3 cross-section. Not all aircraft will be in this ‘Business Class-heavy’ layout however, a batch of them are planned to be based at London Gatwick in a ‘leisure’ configuration, which will feature far fewer Upper Class seats. To give you an idea, currently the eight Gatwick aircraft have just 14 Upper Class seats on the Boeing 747-400. We can’t see them pushing above around 20, so we suspect the A350-1000 version set to replace them may also not feature ‘The Loft’, or at least not in its current location. The A350-1000 with the new cabin products will launch on the airline’s flagship London Heathrow to New York JFK route from August this year, with the exact date and flight number yet to be announced. Virgin also confirmed to Business Traveller that four of the airline’s six daily flights on the JFK route will be flown on the A350-1000 by the end of 2019. That’s all four A350s due for delivery to the airline this year according to A350 Production, so if you’re holding out for another route before 2020 don’t get your hopes up! Going with JFK allows Virgin to ‘lead the march’ over British Airways on this lucrative route, since BA is being forced to use its A350-1000s to secondary cities (Toronto and Dubai) because they don’t have a First Class cabin installed. It will be late 2019 before BA can get its new Club Suite on the New York route with the first retrofitted Boeing 777s, so Virgin jumping on this from August onwards makes perfect sense for them. When will it fly to Asia? Virgin Atlantic operates daily flights from London to both Hong Kong and Shanghai, however there’s no sign of either route switching to the Airbus A350-1000 in the foreseeable future. In November 2018 Oliver Byers, Virgin Atlantic’s Senior Vice President of Sales and Customer Loyalty, told Business Traveller that while the carrier wants to grow these two markets by potentially upgauging Boeing 787s to Airbus A350-1000s in future, the airline “doesn’t have any plans to do [that] just yet”. Make no mistake, the A350-1000 is the transatlantic cash cow for Virgin Atlantic. With Delta calling the shots, it will be some time before we see these new aircraft on routes to and from this part of the world. The best we can hope for in Asia is a retrofit program eventually making its way to the airline’s Boeing 787-9s currently serving Hong Kong and Shanghai, though it seems this is not currently on the agenda and remains only a possibility. Virgin Atlantic is a Singapore Airlines partner airline, meaning you can earn and (technically) spend KrisFlyer miles on their flights. The problem is Virgin Atlantic so heavily restricts award availability on its flights to KrisFlyer members, it’s almost not worth writing about the option. I recall trying to redeem a Virgin Atlantic flight in Upper Class using my KrisFlyer miles a couple of years ago from London to New York, for a relatively flexible trip in March. Virgin’s own ‘Flying Club’ site showed plenty of availability across several flights and dates for its own members, so I figured KrisFlyer should have access to at least one of those seats. Even once I had ‘clarified’ with the phone agent that I wasn’t looking for a Virgin Australia (VA) award but a Virgin Atlantic (VS) one (yes that was the first 10 minutes wasted! ), they still couldn’t access any of the availability. Curious to know if there was any VS Business award space available to KrisFlyer members the kind agent did check and did find an Upper Class seat for me – from London Gatwick to Havana in June! If you do manage to find availability, a London to New York flight in this new cabin will set you back 50,000 KrisFlyer miles, plus taxes. Virgin Atlantic’s current Upper Class cabin is certainly a bit long in the tooth. Revolutionary in its time, it’s now only used by Virgin Atlantic themselves and Air New Zealand (who use the design under licence, and plan to replace it). Similar herringbone designs by Delta and Cathay Pacific have long been ditched in favour of newer seats. This new seat does, admittedly, look really nice. The design team have done a great job with the colour scheme, the bed is longer, storage space is much improved, as is privacy. It’s privacy though where the seat looks to fall a little short. The lack of a door, frankly, is disappointing. It’s also surprising, given what rival British Airways has recently revealed for its competing cabin. That makes us wonder whether BA kept its plans so well under wraps that by the time Virgin Atlantic learned of them, it was too late to replicate anything similar. Avoiding a fully closing door is apparently Virgin’s way of some kind of forced socialising. Or in media speak, ensuring they “maintain a social connection between passengers and crew”. We get that Virgin Atlantic wants to maintain a social atmosphere on its aircraft, but to us that should be a choice for the passenger to make. Not enclosing these seats into ‘suites’ seems a bit of a design miss, and goes against the latest industry trends. The ‘half door’ (which is more of a privacy divider if anything) just doesn’t have the ‘wow’ factor of an enclosed Suite. Without having seen the actual seat, and it looks like we won’t see it in Asia for some time, it appears more like a better version of the Cathay Pacific Business Class product. In some ways, that’s because it is, though Cathay launched that earlier iteration of the Cirrus seat in 2011. This seat is an improvement, no doubt, on Virgin’s already decent offering, but it feels decidedly second-rate compared not only to what BA is rolling out, but what transatlantic cousin Delta already offers on its A350s. In our opinion, either Virgin Atlantic strongly believes its ethos of “maintaining social connections” in the Upper Class cabin, or British Airways truly hoodwinked them three weeks ago with ‘Club Suites’. Hat tip to God Save the Points, Business Traveller and Head for Points. They just announced a loss for 2yrs in a row. Maybe this is all they could afford?